Others were immersed, some could not handle beautiful nudes smoking cigarettes. I was reminded what power art has. The showcase was four months in the making, and it finally took place last weekend, June 3 through 5. I curated objects that were rugged and refined, humble and luxurious. I especially enjoyed putting together the art collection, seeking sensuality, nature, and volatile emotion. Sonia Braga, shot by Michele Comte in 1991 lived next to Strüve’s butterfly wing shot through a microscopic lens in 1928. Brett Weston’s still driftwood and sand dunes lived next to Morgan O’Hara’s spirited graphite drawing. 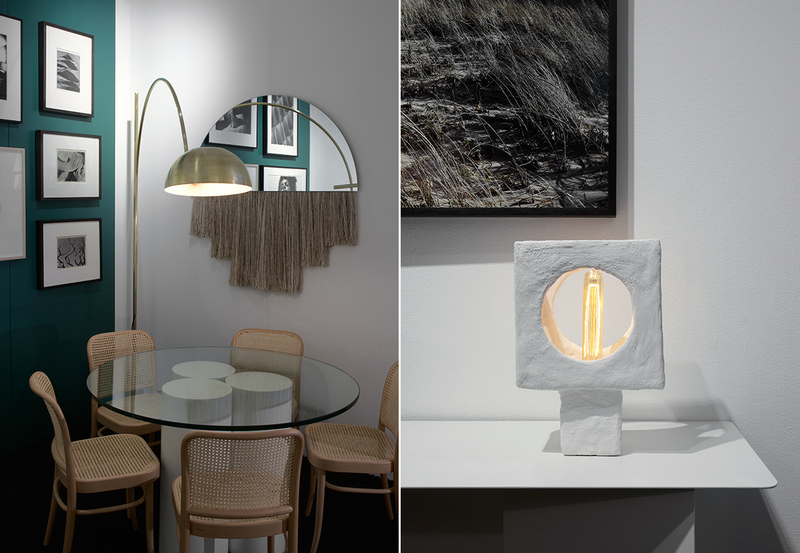 The lamps and tables were designed especially for the show, and made in NYC by trans-LUXE. The Half Moon mirror and Jon Shireman’s Dunes connected with each other across the space. Thank you to all who made this a success: tran-Luxe, Elizabeth Sadoff Art Advisory, Steven Kasher Gallery, Sacco, The Future Perfect, Zen Restoration, Handmade Frames and to Jeff Cate Photography for beautifully documenting it.